Col. Archibald Voris graduated from Hanover College and Harvard Law School. He taught at the Bedford Academy and worked as bookkeeper and clerk at the Bank of Indiana. Voris served as delegate to the Republican National Convention at Chicago in 1860 and was active in securing the nomination of Abraham Lincoln for President. Voris fought in the Civil War and received the commission of Brevet Lieutenant Colonel. Col. Voris had a vision about the limestone industry and devoted much of his time to the opening of the Dark Hollow stone quarry in 1882. He was responsible for developing several local stone quarries and founded the Bedford, Springville, and Switz City narrow gauge railroad for shipping limestone products by rail to other markets. Col. Voris served as president of the Citizens Bank in Bedford and also as president of Citizens Trust Co., Green Hill Cemetery Association, and Bedford Light, Heat and Power Company. In 1892, Voris donated a large limestone mausoleum to Green Hill Cemetery for temporary entombment of bodies during the winter months. 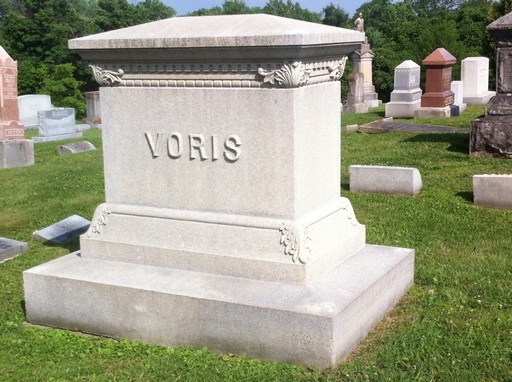 The Voris mausoleum is located across the road from his tombstone. It is empty today.